The most common form of psoriasis in children is plaque psoriasis. It presents itself as small red, raised lesions on the skin that are covered with a silvery film. The most commonly affected areas of the body include the knees, the elbows and the lower back but it can appear on any part of the body. The plaques may sometimes be painful and very itchy. Psoriasis is a chronic condition that usually first appears during the teen years, However, over 20,000 children in the US who are under the age of 10 will be diagnosed with the skin condition each year. Guttate psoriasis, another form of psoriasis that is common in children is usually triggered by bacterial infection (most commonly strep throat). It appears as small (up to 1 cm), scaly patches on the limbs, trunk and scalp. Though it is rare in babies, psoriasis is sometimes mistaken for cradle cap or diaper rash. The normal life span of a skin cell is usually 28 days. Psoriasis is an autoimmune disorder that causes the body to develop these skin cells at an abnormally faster rate. 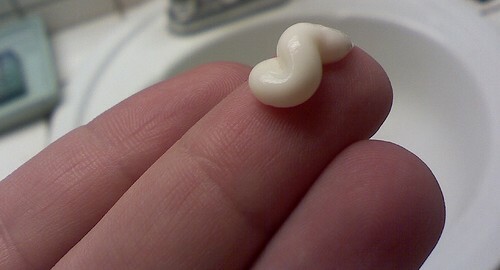 This causes a buildup of skin cells on the surface. Even though the exact cause is unknown, it is believed to have a strong genetic link. This means that people who have it in the family are more likely to develop psoriasis as well. It is believed that for an individual to develop psoriasis, certain conditions must happen. The person must receive a combination of certain genes that work together to cause the psoriasis. The person must then be exposed to certain factors that trigger this combination of genes to cause the disease. These triggers aren’t fully u8nderstood yet or even defined but certain types of infections as well as stress have been identified as triggers. If one parent has psoriasis then there is a10% chance a child will contract it. If both parents have the disease then this percentage increases to 50%. No one can accurately predict who will be affected wit psoriasis. Scientists believe that generally 10% of the population does inherit one or more genes that cause a predisposition to the disease. However, only 2-3% of the population moves on to develop the condition. Symptoms include; severe scalp scaling, nail discoloration and pitting, plaques or diaper dermatitis similar to that which occurs in adults on the trunks and extremities. A doctor can more accurately diagnose psoriasis in children by learning about the child’s family history with the disease and properly examining any lesions the child may have. In some cases a skin biopsy may be needed for a more accurate diagnosis. Skin biopsies involving removing a small part of the affected skin and examining it under a microscope. This procedure can be done in a hospital or at the doctor’s office with a little local anesthetic administered to the patient. Since nearly half of the cases of psoriasis in kids follow an infection, especially strep throat, kids who are more at risk for the condition should take extra care. Washing and sanitizing the hands regularly and avoiding sick people is the best course of action to take. There is no permanent cure for psoriasis. However, mild, topical prescription steroid creams can help the lesions heal more quickly and to an extent control the outbreaks. 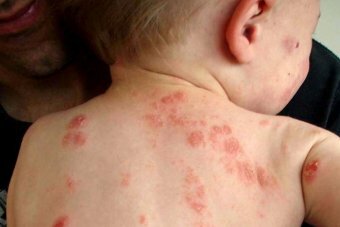 If an infection was the main trigger for the psoriasis, the child may also need some antibiotics. Ask your doctor about other antibacterial medications that prevent further infections from occurring. There are some that can be prescribed to kids even though they haven’t received FDA approval for kids under 18. A little sun bathing can speed up the healing process. You should also talk to the doctor about safe ways to expose the child to the sun. Sunscreen should always be applied before going out to sunbathe. Find out which type of UVB sunlight therapy can be administered to children. Avoid any sunburn as this will only aggravate the psoriasis in children. You can also ask if aloe Vera gel and oatmeal baths may help soothe the itchy, painful skin. Since psoriasis is chronic, your best bet will be to take it into remission for longer periods and manage it as best as you can when the symptoms do appear.